The last (for now) of the Combiner Wars Stunticons! I've been saving my favorite for you guys, let's dig in and see what makes Dead End tick! Dead End turns into a curvy and expensive looking fictional sports car heavily inspired by any number of real world Ferraris but different enough to avoid any licensing issues. He’s molded in a rich burgundy red with silver and grey details and adorned with a dull gold, off center, racing stripe from end to end. He has a Decepticon emblem tampographed on to his hood slightly askew to match the lines of the vehicle. The only real sore spot in this mode are the solid grey chunks behind his front wheels. They form his robot mode biceps and a little paint on the outside would have done wonders for the aesthetics of the vehicle mode. He can plug his weapon into the port behind his front wheel to form a side exhaust pipe. I dig the alt mode; it’s clean and sleek with minimal panelling allowing the natural shape of the vehicle to take center stage. 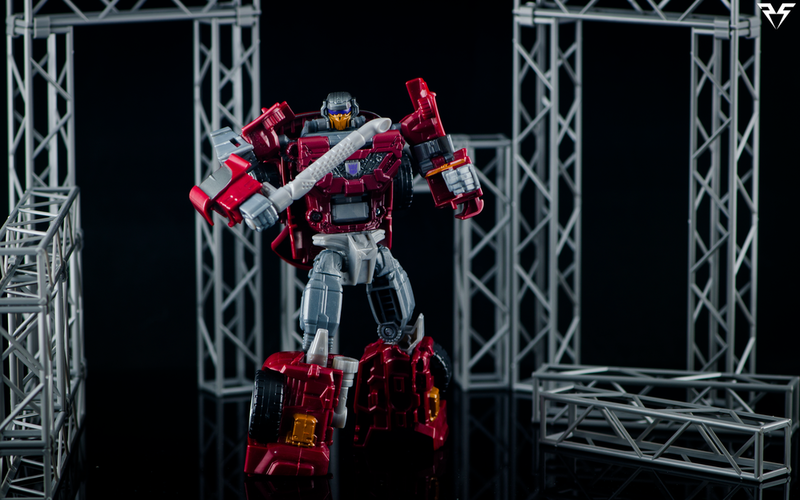 Let’s not beat around the bush, Dead End’s bot mode looks fantastic from head to toe. So let’s start at the head. Yet another victim of an entire head and face replacement Dead End is sporting a mean visored helmet look that deviates from his original G1 design. With a jagged metallic purple visor that would make a chainsaw jealous and twin air intakes on the side of his helmet he looks simply wicked! Like Dragstrip he appears to have been slapped with a mouth covering faceplate. Maybe the rest of the team finally got sick of his doom and gloom predictions and decided to shut him up. Similar to Breakdown he has a chest piece that covers a good portion of his combiner port and sports a nice little Decepticon badge on the center. His ball jointed shoulders, bicep swivel, elbow and wrist joints allow for a wide range of posing. The wrists swing out from in the forearm, so there is a bit of unintended posability offered by clicking them in one or two notches. He has the same waist swivel as the rest of the limb robots and giant boot looking feet made up of the back end of this vehicle mode. 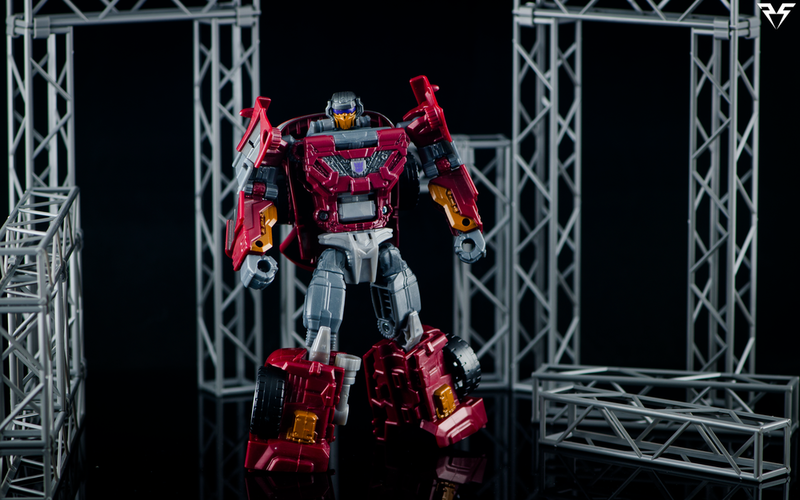 He is slightly asymmetrical as there is a flip out port on the one leg that is meant for combined mode. The colors in this mode are very cohesive and make for a great looking bot. The grey biceps, while causing an eyesore in vehicle mode, do a lot to help break up what could have been a monotonous color scheme. He looks ready to throw down and kick some Auto-Butts any second. Speaking of, let’s check in and see what number of elegant utensils he uses to serve up the pain. A lead pipe. You heard (or rather read) me right. 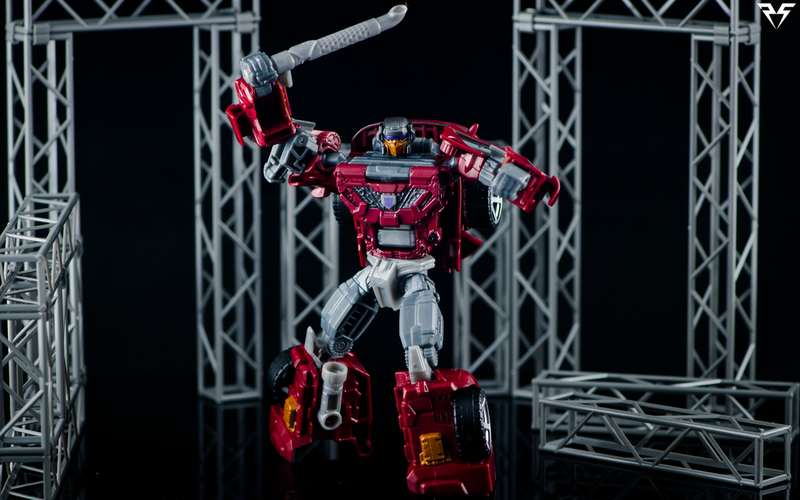 This guy is so hard he forgoes any attempt at firepower and just bludgeons Autobots to death. His Vehicle mode exhaust pipe becomes a good ole metal crunching, head splitting, beatin’ stick. It does have the 5mm post used in vehicle mode that can peg in to his hand… if you want a curved rifle that fires straight up. Doesn’t seem too sensible to me so I’m just using it to hit things. He also comes with the same combiner piece the rest of the Stunticons come with. The weaponry on the knuckles is either 2, triple barreled blasters, or maybe pile drivers similar to the ones that came with Hasbro’s Transformers Prime Rumble. 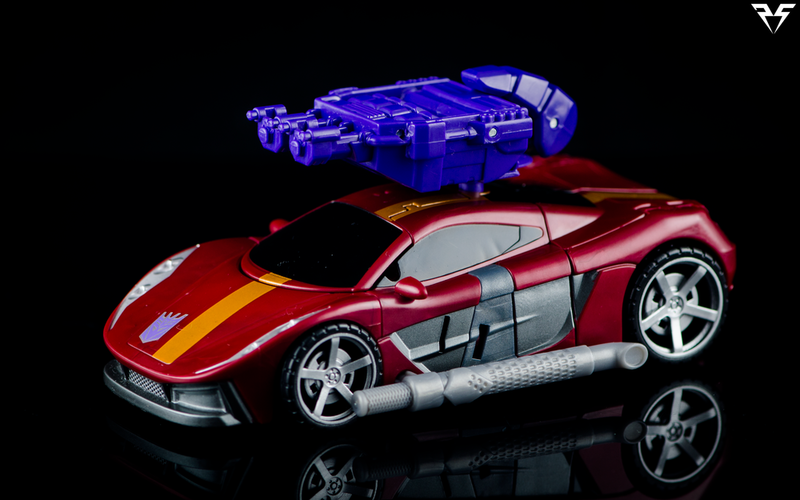 The combiner weapon can be mounted on the roof of the vehicle mode, or he can hold it as a blaster. It can also be pegged in to his shoulder armor in bot mode for a shield or shoulder mounted blaster. Dead End is in my opinion the strongest mold coming out of the Stunticon camp. 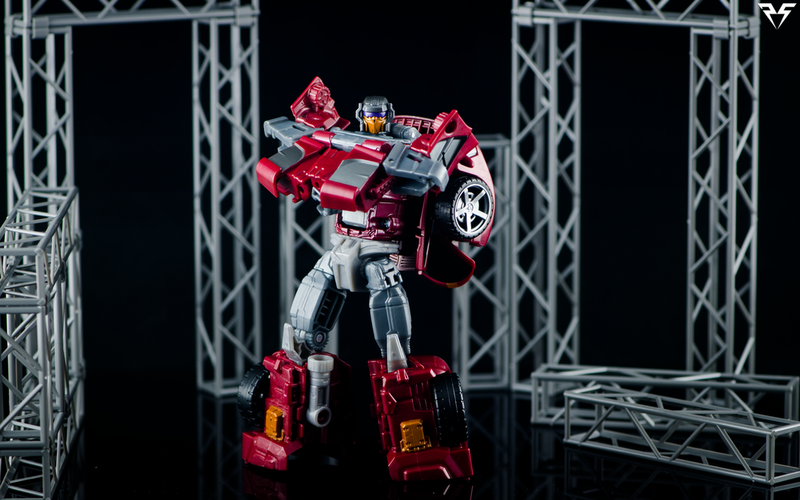 The vehicle mode is lean and mean and his bot mode looks ready to rumble. He's got decent posability and is a mold that really shows what Hasbro can achieve even with the reduced budget of recent years. 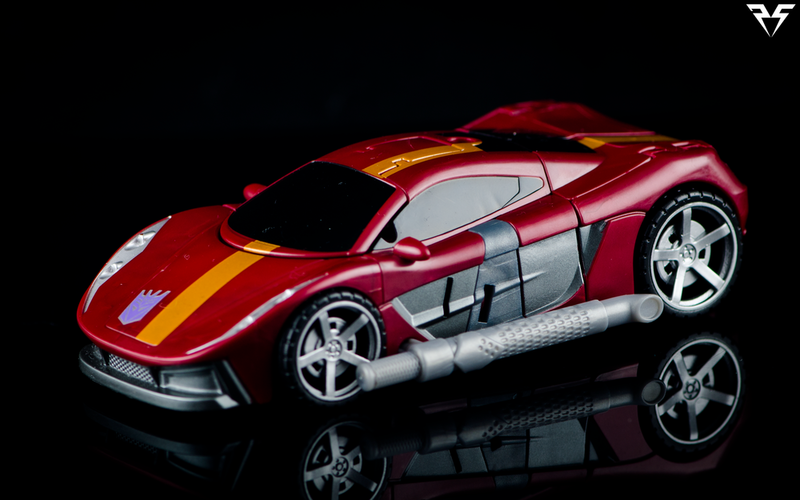 I'm looking forward to seeing Brake-Neck (Wildrider) and street wise put their own flavor on the mold. Unique melee weapons seem to have become somewhat of a theme in transformers lately replacing the more often included generic blasters. While I'm a fan of projectile launchers and blaster rifles it's hard to begrudge a dude brazen enough to show up to a fire fight with an exhaust pipe. Dead End is simply fantastic and even if you plan on skipping Menasor I highly recommend getting your hands on at least one of the characters that will be sporting this mold.